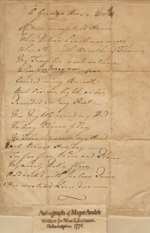 John André (1751 –1780) was a poet and artist as well as a celebrated gentleman and officer highly regarded for his gallantry and honor. His personality, charm, and talent made him admired even by his enemies. Born in London and educated in Geneva, he enlisted in the British army in 1771. He saw action during Revolutionary War and joined General Sir William Howe’s army, which occupied Philadelphia during the winter of 1777 through 1778. André wrote poems and plays, drew sketches, and designed costumes and scenery for theater. André was responsible for planning the famous party in Philadelphia, the Meschianza. This was a festival during the British occupation thrown by André and his fellow officers in celebration of General Howe, who was being relieved of duty and sent back to England. André became aide to the newly arrived General Sir Henry Clinton, Howe’s replacement. Clinton made André a major spymaster, leading to the events that would cement his fame in Revolutionary history and also lead to his death. André became the sole British agent in contact with Benedict Arnold and helped plan the notorious defection and attempted betrayal of the West Point fort to the British. André’s capture following a meeting with Benedict Arnold led to Arnold’s exposure as a traitor. 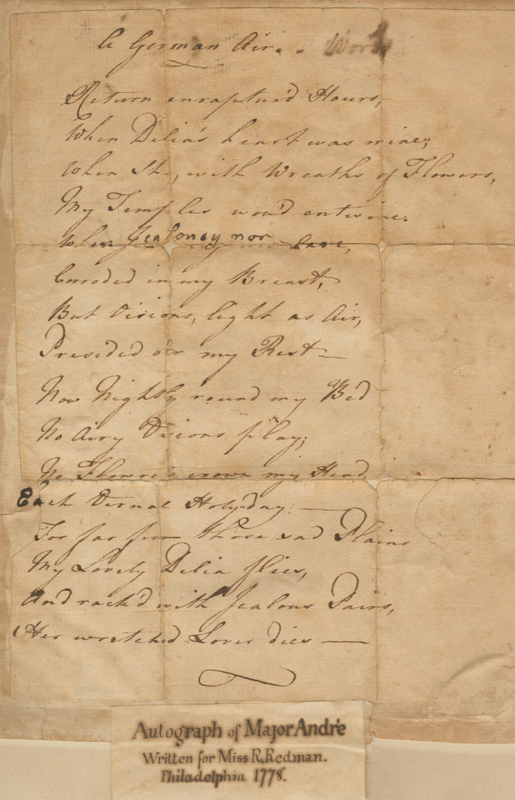 The American militia found the West Point plans concealed in André’s boot as he was attempting to rendezvous with his ship dressed as an American officer. As Arnold fled to the British lines to seek refuge from the assured death sentence for his treasonous behavior, Major André was sentenced as a spy to hang in Tappan, New York. A monument still stands on the site of the gallows. Although he was sentenced to death by hanging, many, including George Washington, mourned his death as the unfortunate yet inescapable consequence of the war. The Meschianza was an extensively planned series of events which took place on May 18, 1778 at “Walnut Grove” the estate of Joseph Wharton. It began with a trip down the river on festooned barges, followed by the mock jousting tournament between the “Knights of the Blended Rose” and the “Knights of the Burning Mountain.” The party concluded with a lavish dinner and ball. The Loyalist young ladies stood in stark contrast to the rest of the population of Philadelphia, particularly the chaste and sober Quakers. Of the Meschianza, Quaker Elizabeth Drinker wrote, “How insensible do these people appear, while our Land is so greatly desolated, and Death and sore destruction has overtaken and impends over so many.” While the party was resented by many, it remains a notable part of Philadelphia history. Library Company of Philadelphia, Gift of Mrs. John Meredith Read, 1900. 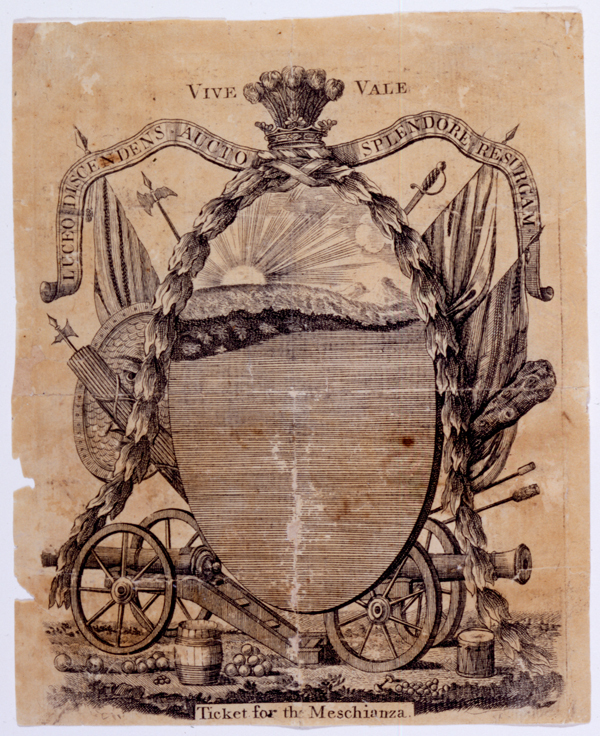 The ticket is an original invitation to the Meschianza, a festival in British occupied Philadelphia that honored the departing General William Howe. André actively planned the details of the Meschianza, from the location and events down to designing the costumes the partygoers would wear. The invitation depicts the sun setting over the sea. 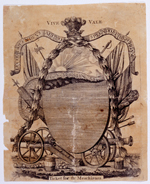 Howe’s crest is shown along with the motto, “Luceo discendens, aucto splendore resurgam” [Descending I shine; with added splendor I rise again.] Cannons, swords, drums, flags, and other military apparatus decorate the borders. Walnut and gilt mirror with beveled edge. 68" x 29" x 2". This richly decorated frame has carved and gilded moldings with pendants of leaves, blossoms, and fruit. Lettered around the frame in gilt reads, “Mischianza-1778. / This mirror was in the ballroom of the Wharton House, Philadelphia at the above date & on the occasion of above fête./ General Meredith Read’s André relics.” The Meschianza ended with a ball, which took place in an elaborate canvas tent. The interior of the tent was painted and decorated with mirrors (including this one) and chandeliers, many of them borrowed from neighboring mansions. A Verse Written to a German Air, 1778. 10 1/2" x 8" . 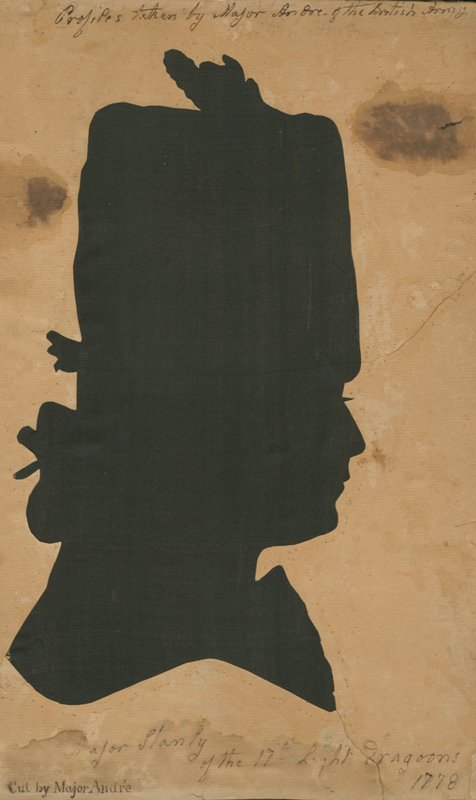 Silhouette of Major Edward Stanly, 1778. 13 1/2" x 9 3/4". John André cut this silhouette of Major Stanly of the 17th Light Dragoons, later the Earl of Derby, and presented it to Rebecca Redman along with several other gifts. Silhouettes, profiles traced from shadows and cut from paper, became popular during the 18th century. 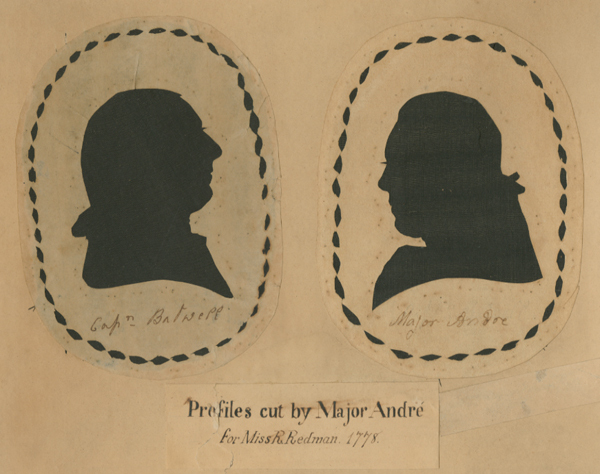 Silhouettes of Batwell & André, 1778. 8 3/4" x 9 7/8". The Library Company of Philadelphia, Gift of Mrs. John Meredith Read, 1900. These silhouettes are of British officer Captain Lullum Batwell of the 46th Regiment of Foot, and Major André himself. The silhouette of the artist presumably was traced by another and then the final cutout fashioned by André and presented to Rebecca Redman.